What is a Caravan Cover? 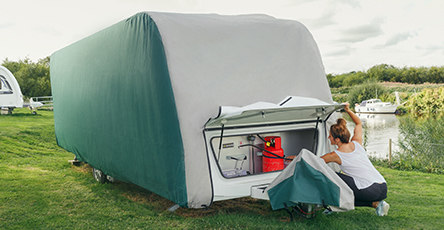 Our Caravan covers are made to protect your caravan from the elements when you store it away, ensuring it is nice and clean for when you need to use it again. Your cover will come with door access, aerial pocket and an A-frame cover as standard. Please note that delivery is currently 6 weeks from order. All our caravan covers are specifically made to each individual caravan. Every Make, Model and Year of caravan is different – so you can imagine the number of patterns we have had to take! All covers fit perfectly to the caravan ensuring there is no excess material to flap around. Why settle for just waterproof or just breathability when you can have both? Our caravan cover fabric is designed for you with the balance of both worlds in mind, as they are equally as important. Some covers on the market are water resistant and breathable, ours is waterproof and breathable! Our caravan covers have a soft non-scratch backing that will not scratch your caravan! Make sure you clean the caravan first so nothing is trapped between the cover and your vehicle and your caravan will be in pristine condition when you come to uncover it! Because it is important to be able to access your caravan when in storage, our tailor made caravan covers come with a door access as standard. With an easy to use industrial Velcro strip and a strap, you can go in and out of your caravan as often as you like! Most new caravans are now fitted with a solar panel. If you need your battery to be trickle charged during storage, we can add in a Perspex window to the roof of your cover. This should only be used if you require your battery to be topped up. They should not be used in the summer, on excessively hot, bright days or where surfaces may reflect back on to the solar panel. There will be an additional charge of £75 and we will require measurements as even though they are factory fit it is not aways in the same place. Please complete dims sheet here. The last thing you need when you have put on your cover is to have forgotten something in the locker box. We can add in an access point for locker boxes, battery boxes wherever you need them should you choose. Choose from 3 colours – Green, Grey or Blue with no additional charge. Or if you like to mix and match your colours, you can have a two-tone cover at no extra cost. At the shows we like to have a silver top and green side two-tone cover. What benefits are there to having a caravan cover? A tailored fitted cover will provide extensive protection from adverse weather condition, bird dropping, pollution, dirt, black water streaking and UV damage. The cover is an added deterrent from thieves and prying eyes. Rubber seals round the windows are protected from perishing. Curtains, furniture and decals will be protected from fading. Overall complete protection and a reduction in cleaning time. Is there an issue if I have Paintseal on my Caravan? It has been brought to our attention that caravans that have had Paintseal applied do seem to show a dulling to paint work when our Caravan Cover is removed. This is not damage and has not caused any issues to your paint work. It would appear the cover is acting as a buff agent and is buffing up the paint seal and creating a dull appearance. This can simply be removed with cleaning and polishing if required. If you have any concerns, please contact our sales team. How do I store my caravan cover when I'm not using it? The caravan cover comes complete with a free storage bag to safely store your cover when not in use. It is preferable to remove your cover on a dry day for ease of storage. Allowances are made for aerials, flues and air conditioning units. We recommend that sharp objects on the exterior of your caravan such as aerials and gutters are protected with bubble wrap and foam inserts which we provide in the fitting kit. This prevents any damage to the cover. Full fitting instructions are included with every cover. Do the covers have a door opening and how is it fixed? Yes, there is a Velcro access door so you can still use the caravan whilst the cover is on. Zip fastenings for access doors are not recommended as they could scratch paintwork / windows during fitting and when in situ. How does the cover secure onto my caravan? All caravan covers have four elasticated corners and a minimum set of six webbing straps (dependent on length of van) which pass underneath the caravan and fasten with buckles. Full fitting instructions are included with every cover. Will the caravan covers scratch the paint work or windows? Our unique fabric called Torrent, is a non- abrasive multi-layered fabric designed to protect vehicles from the harmful effects of direct sunlight, dirt, abrasion and damp weather. Our covers are tailored made to each van, eliminating any loose fabric flapping around the side of the van which can occur with a universal fitting cover. The fabric has been specifically designed for the purpose of covering caravans & motorhomes and therefore will not scratch the windows or paintwork. Our fitting instructions recommend that the cover be placed onto a clean caravan to ensure that no dirt gets onto the inside of the cover. Do you have the measurements for my caravan cover? We have an extensive database of all makes and models of caravans available. Simply call to confirm if we have your caravan on file. If not we can email or send you a dimension sheet for completion. The covers are manufactured in a unique multi-layered fabric called Torrent designed to protect vehicles from the harmful effects of direct sunlight, dirt, abrasion and damp weather. Torrent is fully waterproof (not water resistant which will allow water to penetrate) and breathable by having a directional membrane sandwiched in between the fabric layers. This innovative fabric is EXCLUSIVELY available to Specialised Covers only! The fabric is guaranteed for 3 years when used in the UK. Usage outside the UK will result in the guarantee being null and void. Excellent tailored fit for our 2019 Eriba Familia. The material appears and feels very durable. It is a pity the A frame cover cannot be attached to the main cover some way, possibly using velcro or similar. Excellent customer service, keeping us informed each step of the way. The product is fit for purpose although overpriced due to lack of competition. The poles provided to pull the cover over could be stronger as one snapped. Cover looks very neat on the caravan. I was pleased with the foam inserts which was a good thought. Overall a necessary purchase to keep my caravan in good order but shame about the price. Pleased with the quality, It was not easy to put on, to heavy to pull over the van with the poles, we had to get step ladders to help pull it over. This ripped the sharp edge protection off. The security straps were far to long and difficult to adjust took us a long time, had to adjust from both sides, should be quicker next time. Poles are not strong enough. Items were as decribed and of good quality. Fitting instructions were good. A bit difficult for my wife and I to fit the winter cover on our caravan as the cover can be quite heavy particularly when windy and the front of our van has limited access when in its storage position. Overall very pleased with our purchase and would recommend Specialised Covers to others. A first date product which fits the caravan like a glove. Other caravans on site were commenting on the finish and the material plus the design in glowing terms. Specialized Covers customer service was first date as they kept me informed of the cover production process through to delivery. I would definitely recommend a full caravan cover from this excellent company. Made and delivered in the timescale we were given at purchase. Our new cover fits our van perfectly. Delivered exactly as promised too. Excellent fit. Looks very good. Excellent fits well, made of durable waterproof material. Top quality materials and good fit, all manufactured to given specification. I do not believe you will get a better hand made product. I would recommend to all. The cover seems well made and fitted my caravan very well. There is enough material to enable easy fitting but the cover fits snugly without too much flapping about. I would suggest that the hitch cover would benefit from being made a few inches taller to cater for the jockey wheel post being raised..
Haven't used yet - but the Tow Pro is great so I'm sure this will be. Great service.